The first name in food dehydration presents the D900 Series, featuring the exclusive turbo charged Parallexx Drying System. The Parallexx design, with a temperature controlled, fan forced, horizontal drying system mounted in the rear is exclusive to the D900 Series. The same features found in Excalibur's USDA approved $5000.00 commercial model...in an affordable home unit. BUILT IN TIMER - 26 hour count down timer automatically turns the dehydrator off. STAINLESS STEEL TRAYS - 100% welded stainless steel trays so your food does not have to come into contact with plastic. The New Excalibur D900 is the stainless steel version of the 3926T model. 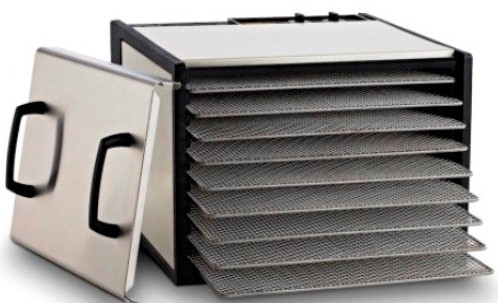 It has a plastic case that has stainless steel inset panels to offer the upscale look to your dehydrator. In addition it offers 9 100% stainless steel trays, stainless steel door and a 26 hour count down timer that will turn the dehydrator off automatically. Removable door and trays - do not have to be taken apart to check drying or add more food. Unbreakable 100% Welded Stainless Steel Trays. Noryl plastic cabinet with Stainless Steel Panels and Stainless Steel door. The Excalibur D900 includes the 26 hour count down timer, that will automatically turn the dehydrator off. Each excalibur dehydrator includes a FREE Dehydration guide, a $6.95 value! A $24.95 value! 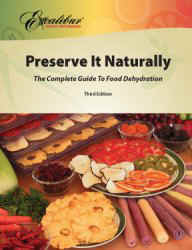 In this 192 page book you will learn everything about dehydration includes recipes too! Also Includes a Raw Foods Section. What is a Premiflexx non stick dehydrator sheet? Our Premiflexx non-stick sheets are solid sheets, unlike the mesh sheets that are included with the dehydrator. They are washable and re-useable. They are used for dehydrating liquids (such as blended fruits- to make fruit roll-ups) or really sticky/gooey items that would normally drip through the mesh sheets that are included with the dehydrator. They are also required for making THIN sprouted essene breads and crackers. Order Premiflexx sheets separately here. The fan, heating element, and adjustable thermostat are mounted in the rear. Cool air is drawn in the back, heated up, and distributed evenly across each tray. During the dehydration process, warm air removes moisture from foods and is pushed out the front of the machine. Normal drips fall on the electrical controls beneath the food. This can cause electrical problems as well as being very difficult to clean. The more trays that are added, the further the food is away from the heat, dramatically increasing the drying time, and requiring frequent tray rotation day and night to prevent spoilage. Who wants to "BABYSIT" THEIR DEHYDRATOR?!! Ordinary dehydrators produce constant, unchanging heat causing case hardening, a dry surface with moisture trapped inside - a perfect environment for bacteria growth. Excaliburs Adjustable Thermostat lets you take advantage of Hyperwave Fluctuation (changing heat through the drying cycle) for faster, better, safer dried foods. As the temperature fluctuates up the surface moisture evaporates. Then as the temperature fluctuates down the inner moisture moves to the drier surface. The food temperature stays LOW enough to keep the enzymes active, and the air temperature gets high enough to dry food fast, overcoming bacteria growth and spoilage. Perfect for raw and living foods. The family size economy model, large area ideal for volume drying. Holds lug of peaches, 7 large pineapples. 15 square feet of total drying area. Sold for USE INSIDE THE USA. We do not sell Excalibur Dehydrators for export either directly or indirectly. Need further information about this product? Click here to view the manual for this product.